3.6 out of 5 based on 17 bloggers and 4 commenters. 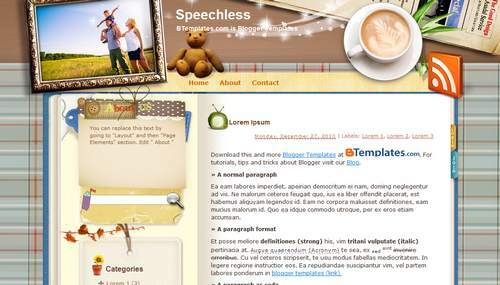 Speechless is a free blogger template adapted from WordPress with 2 columns, left sidebar and rounded corners. Excellent template for blogs about desktop or family. Can the image be changed? How can we change the picture ? it’s possible ? Thanks very much, good job. Does anyone know if the picture can be changed?